2016 Mercedes-Benz S 500 Cabriolet review | What Car? Mercedes' S-Class is almost a brand in itself: it stands for the ultimate in limousine luxury and has led the way in technology and safety for years. Last year Mercedes launched a two-door Coupé version of its latest limo, and now the coupé has lost its roof to become the Cabriolet. It's available with three engines: an entry-level 4.7-litre turbocharged V8 in the S 500, a bi-turbo 5.5-litre V8 in the raucous S 63 AMG and a staggering 6.0-litre turbocharged V12 in the range-topping S 65 AMG. The AMG models are standalone trims, while the S 500 is available in just one: AMG Line. 'Entry-level' probably isn't the right phrase in this case though, because the S 500 costs a whopping £110,000. That puts it in direct competition not only with rival luxury open-tops, such as Bentley's Continental GTC V8 but also slightly cheaper options, such as BMW's 6 Series Convertible and Maserati's Gran Cabrio. 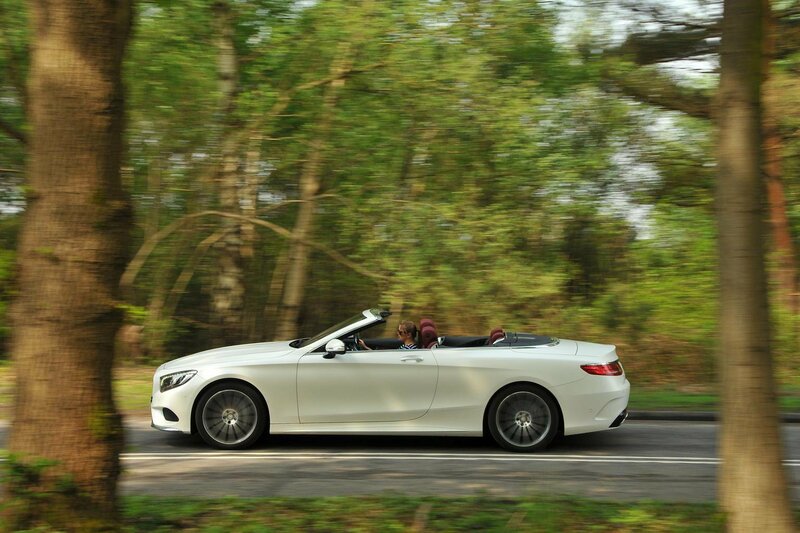 What is the 2016 Mercedes-Benz S 500 Cabriolet like to drive? There's certainly nothing entry-level about the S 500's V8 engine. It plays the hushed cruiser brilliantly, but wake it up with a prod of the accelerator and it changes character immediately. Mercedes' nine-speed dual-clutch automatic gearbox is intelligent enough to rely on the 500's massive low-down pulling power rather than change down when accelerating, although switching to Sport mode encourages it to use higher revs in a lower gear. In Sport, accelerator response is improved, too, and the 500 will do 0-62mph in just 4.7sec. Sure, the Cabriolet weighs 85kg more than the Coupé, but you'll never be able to tell. Sport mode also adds weight to the steering and stiffens the 500's standard air suspension, and just as the 2115kg Cabriolet's 0-62mph time is scarcely believable, so is its ability to deal with corners. The steering is a touch heavy in Sport, but the way the 500 maintains a level body in turns and feels eager to change direction makes it more fun than it should be to drive. Don't get us wrong - you can still feel how heavy this car is, and it feels happiest at a stately cruise, but it does also reward more than you expect if you drive it with some vigour. Switch to Comfort mode and the suspension is allowed to breathe, the steering is slackened slightly and the exhaust becomes more muted. In this state its ride quality is impressive, with very little evidence that you're sitting in a less-rigid open-top. 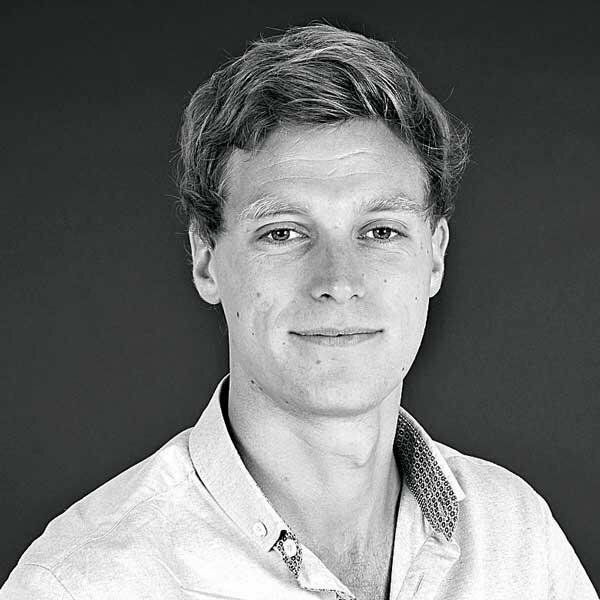 Large speed bumps are soaked up easily, and without too much pitch and dive from the body, while typically scruffy British road surfaces glide beneath the car with only a subtle, easily ignored shiver. It's only over sharp-edged potholes, particularly when cornering, that you get a heavy thunk and shudder, and a touch of body flex; otherwise the S 500 Cabriolet is a slick, indulgently comfortable thing. Roof up, this is about the quietest convertible on sale, with hardly any road or wind noise, even on the motorway. The engine is mill pond-smooth at all revs, too, and barely audible at a cruise. Dropping the S 500's roof takes round 20 seconds at speeds of up to 30mph, and the experience doesn't get much less refined. Windows up and standard electronic wind deflector in place, there's very little buffeting at any speed, and Mercedes' standard neck-warming Airscarf feature is a welcome addition. However, those in the back will feel quite blown about at anything more than urban speeds, despite the presence of a front deflector mounted on top of the windscreen to help protect rear passengers. What is the 2016 Mercedes-Benz S 500 Cabriolet like inside? Every bit as luxurious as its limousine and Coupé cousins. There are swathes of fine leather on the Cabriolet's dash, doors and seats, while its metallic switches and infotainment controller have a suitably high-end look and feel. Mercedes' Comand Online infotainment system with 12.3in colour screen remains visually impressive and logical, if not quite as simple to navigate as BMW's iDrive. There is a massive amount of space in the front, and the driver gets a huge range of electronic seat and wheel adjustment. The front seats are decently supportive in fast bends, but also supremely comfortable on long journeys. 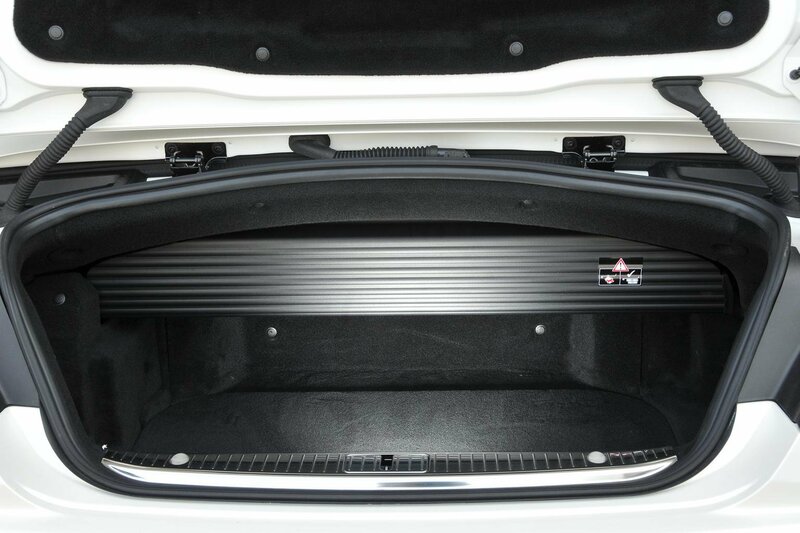 The two rear seats, however, aren't quite as accommodating. There's some bargaining room on the passenger side if the front seat's occupant moves forward, but it’s a squeeze to fit two adults one behind the other on the driver's side. Even so, head and shoulder room for adults with the roof up in the back is good. Boot space with the roof up and divider moved out of the way stands at 400 litres, but divider and roof down, that space is considerably less. It's good that the divider moves automatically so you don't need to get out and do it yourself, but there's really only room for a couple of large (but soft) weekend bags if you want an open-air experience. Even a weekend away with three or four people is going to pose a problem for luggage space. At least you don't need to dig deep into the options list. AMG Line trim brings luxuries such as 19in alloy wheels, air suspension, climate control, automatic LED headlights and auto wipers, heated and electrically adjustable front seats and heated rear seats, sat-nav, Bluetooth and DAB radio, although the full list runs far longer. An S 500's list price looks cheap next to a Bentley GTC V8's, but it is higher than a BMW 650i Convertible or Maserati GranCabrio's. However, considering the sort of figures we're talking about, the step up from shouldn't be a problem for the majority of buyers. It's a step up worth making, too. The S-Class Cabriolet is superb at being a comfortable, refined cruiser roof up or down, and it offers performance and handling to enjoy, should the situation arise. The BMW fails to offer such a broad dynamic package, while the Maserati feels cheaper inside and suffers second-rate infotainment. 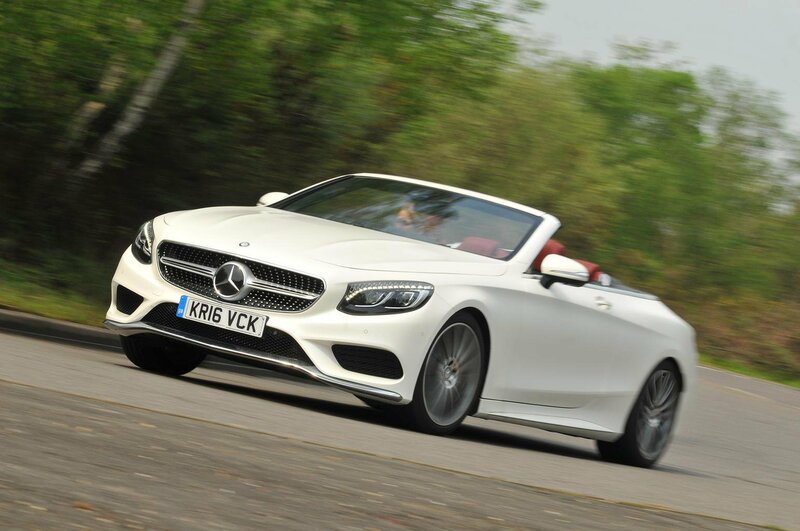 Running it closest is the Bentley GTC, but despite that car's similar refinement, handling, performance and luxury, it manages to make the S-Class Cabriolet look like a bit of a bargain, because the Bentley costs around £44,000 more to buy. 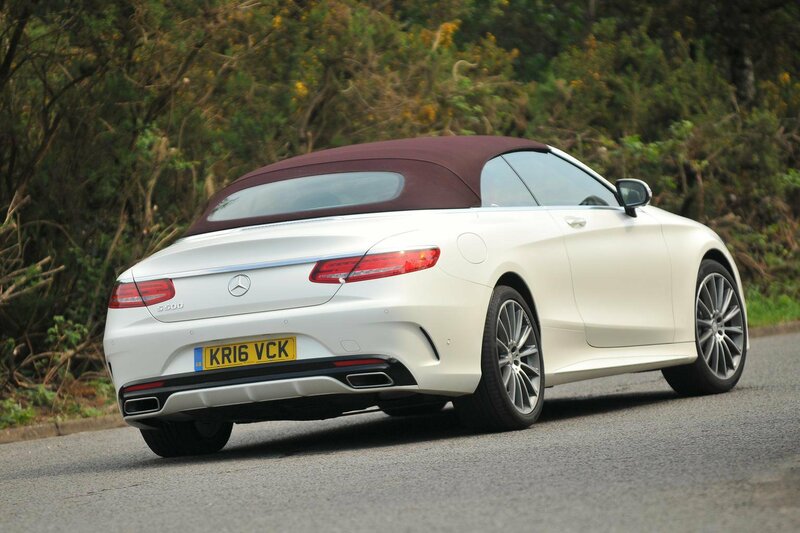 This, and its brilliantly well-rounded set of talents, means the S-Class Cabriolet now sets the benchmark of luxury open-top motoring.